GOSH is fast becoming one of my favourite drugstore brands in the UK, and in particular I really love their nail polishes, lipsticks and eyeliners. 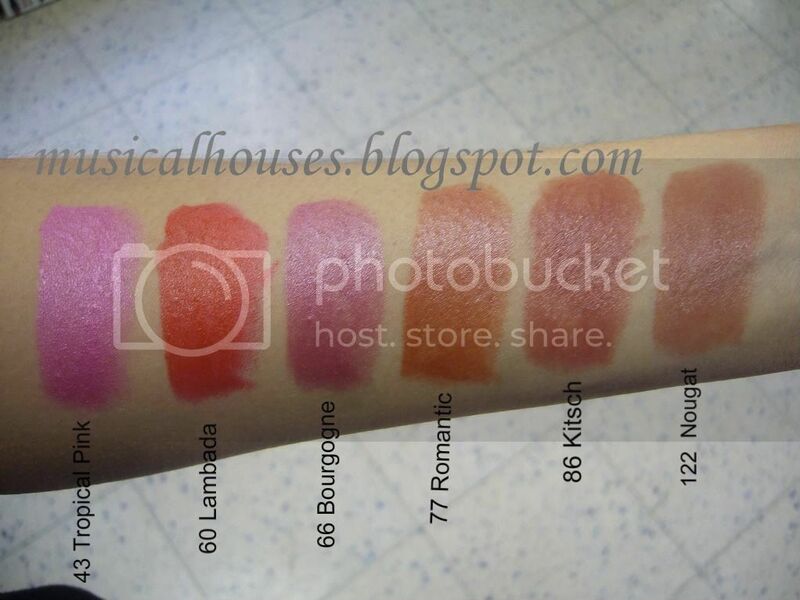 They aren't the cheapst drugstore brand around, but they have a really good range of colours, and some kickass products. Today, I bring you part 1 of 2 of the GOSH lipstick swatches. While these aren't as pigmented as the Barry M Lip Paints, they're definitely not sheer, and they're still pretty pigmented. They also smell of vanilla and crayons mixed together - they smell sort of, but not quite, similar to a MAC lipstick. 43 Tropical Pink is a bright, neon, lavender pink. This is NEON okay, although my swatch doesn't quite show it (stupid camera). 60 Lambada is also a bright neon tomato red, and if you wore either Tropical Pink or Lambada down the road, you're definitey going to be stopping traffic. Bourgogne is a very pretty pinky-plummy colour, and it's like a much more pigmented and brighter version of MAC Sweetie - I likey! This is definitely one of my favourites. I've no idea what Bourgogne is, but someone told me it's a geographical place. Hmm. 77 Romantic is a pinky-brown with a hint of peach, which makes it warm-leaning. 86 Kitsch is also pinky-brown, but without the peach, so it's not as warm, and more neutral. This is also one of my favourites, it's a universal workhorse colour like MAC's Twig. 122 Nougat is a very browned pink, and not as pink as Kitsch, or as peach as Romantic. Nougat looks like a nice "my lips but better" shade. the bourgogne colour looks pretty. I can't wait for your swatches. p.s are you going to post the giveaway winner tonight? I've never tried any of these products, I'm gonna have to go buy some, great ost these are really pretty colors!! Check out my new fashion blog! I have Tropical Pink and I want Lambada, which is weird considering I'm shy about bright lip colours. But I tend to apply Tropical Pink lightly anyway, so it doesn't look quite as bright. I love the texture and the packaging of these lipsticks, though. Ooo I really like all the pretty colours! i don't really like lipsticks, but these look pretty. love the bourgogne too. i don't know GOSH, but you gotta try the lancome lipstick sold here in singapore!! (i think it's only available in asia) i bought lancome color fever dewy shine in retro rose last week and i loveeeeee it!